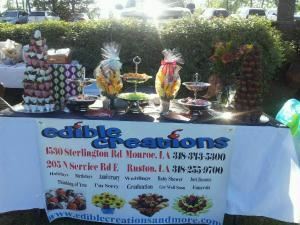 Edible Creations' offer fresh fruit arrangements design to perfection like flower arrangements for any occasion. Our arrangements make great centerpieces at events! We also offer fruit, veggie, and sandwich trays. Chocolate strawberries, cupcakes, pretzels, caramel apples, chocolate apples, etc are also available.